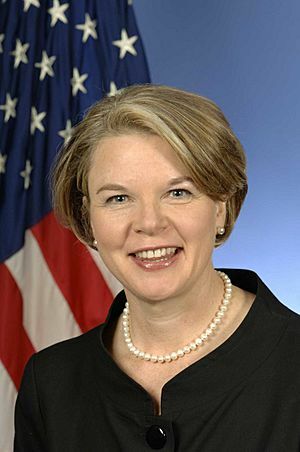 Margaret Spellings (born Margaret Dudar on November 30, 1957) was the second Secretary of Education under the administration of U.S. President George W. Bush. She was previously Assistant to the President for Domestic Policy to President Bush. She was one of the principal authors of the 2001 No Child Left Behind Act. 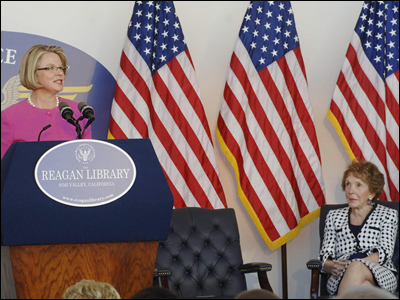 Spellings delivers a speech at the Ronald Reagan Presidential Library; former first lady Nancy Reagan is seated at the right. Margaret Spellings Facts for Kids. Kiddle Encyclopedia.